I hear this ALL THE TIME. I heard it within hours of my daughter’s birth. So many people have commented on how very much my daughter looks like me that I have had to do a lot of work over the past few months to figure out why this comment bothers me so much. I know people are saying this because they love us and are supportive of our family. I know that they say this with the best of intentions. But here is the thing, straight people hardly ever know what it’s like to have a child with someone you love and not both share a biological connection to that child. At best, (given current limitations in medical technologies) only one parent in a relationship that includes two female bodied people can be biologically connected to a child. Unless of course, a couple uses the non birth parents’ sibling (or other close relative) as a donor. But still, when straight people go on and on about how much a child looks like one of its female bodied parents, they are drawing attention to the fact that the other parent doesn’t share the connection of resemblance. I’m ok with the fact that my daughter isn’t biologically related to both of her parents. I don’t believe that biology makes a family and I don’t see biology as some definitive marker of an authentic connection. So, having people draw attention to the fact that only one of us shares our child’s biology isn’t what bothers me most. What bothers me most is that people presume that because I gave birth to my daughter that I am her biological mother. In fact, I am not her biological mother. My wife is. My daughter was conceived using my wife’s eggs, donor sperm, and my uterus. So when people comment on how much she looks like me. I can’t help but wonder “does she really?” When I look at my baby, I see my partner. 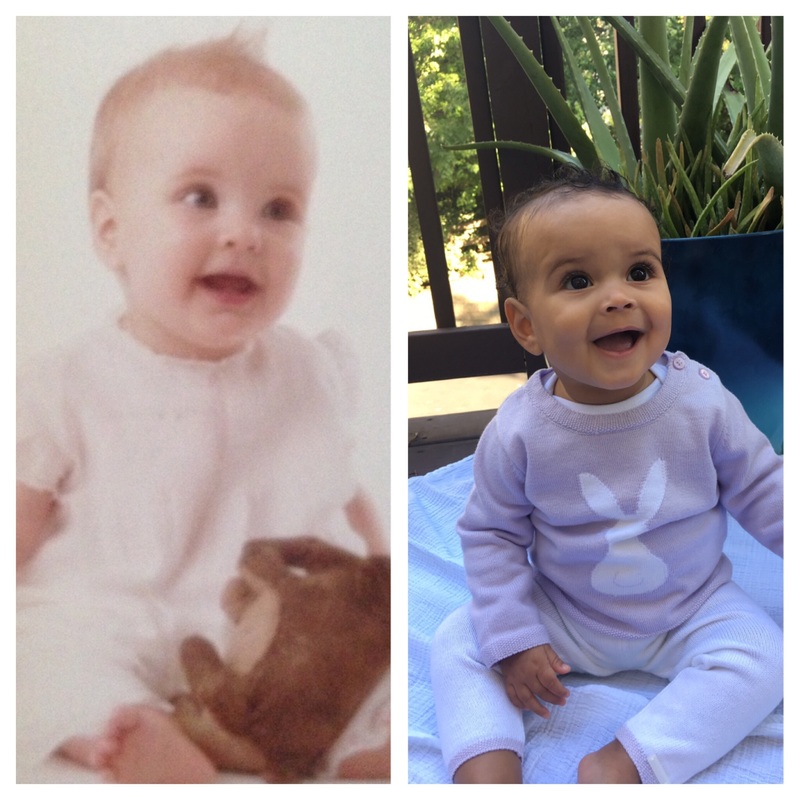 The resemblance between my wife as a baby and my daughter is astounding to me. But people never comment on how much, our daughter looks like my wife (save a few very close family members). So when people tell me how much my daughter looks like me, I can’t help but wonder “ What do they see?” My daughter is brown like me, my wife is white. Do people immediately see a child that looks like me because we share a skin tone? My wife and I intentionally picked a brown donor… but why wouldn’t we? We are, after all, a mixed race family. I realize that most people don’t know any of the specifics on my daughter’s conception. But still it irritates me when they remark on our resemblance for two reasons: 1) it rewrites our story 2) it reminds me that you need biology for legitimacy even when I don’t. The thing is that I am proud of how my daughter came into the world. I feel fortunate beyond measure to have had the opportunity to grow my partner’s embryos into a human inside my body. It’s a testament for how my partner and I approach everything in life… together and always on the most difficult path. So when people don’t see this part of our story, they rewrite our story into whatever fits in with their idea of how two female bodied people make babies. But in rewriting our story people simultaneously de-queer it. They eliminate the years of struggle and sacrifice that my partner and I underwent to bring our daughter into the world. The emotion work we had to manage, to mentally prepare ourselves to take this path. A path that we traveled alone: not knowing a single other family who conceived their babies as we did. That struggle has made us stronger as a family and when you rewrite our story you eliminate this aspect of our struggle. Getting to a place where I don’t privilege biology has taken work. And when someone focuses on the resemblance between my daughter and I, I am reminded that they need biology for legitimacy. I get it. I was raised in this world too. I know why you hang on to biology so tightly. But I don’t want to play by those rules. We make our own rules. So if you are telling me how much my daughter looks like me because you think it will make me feel good. Don’t. I’m good. I promise. I know that my family doesn’t fit into the “normative” model that we are all taught growing up. And I love you for supporting us anyway. I love you for doing the work to get on board with what we need to be validated in a heteronormative society. So how about we just focus on what makes our baby great. What makes her strong and bold and vibrant. Let’s all just move passed that question of who she looks like in the same way that we move passed the “whose the daddy question.” Thanks straight allies for your support and love and for trying. I will do my best to keep teaching as long as you are willing to listen.